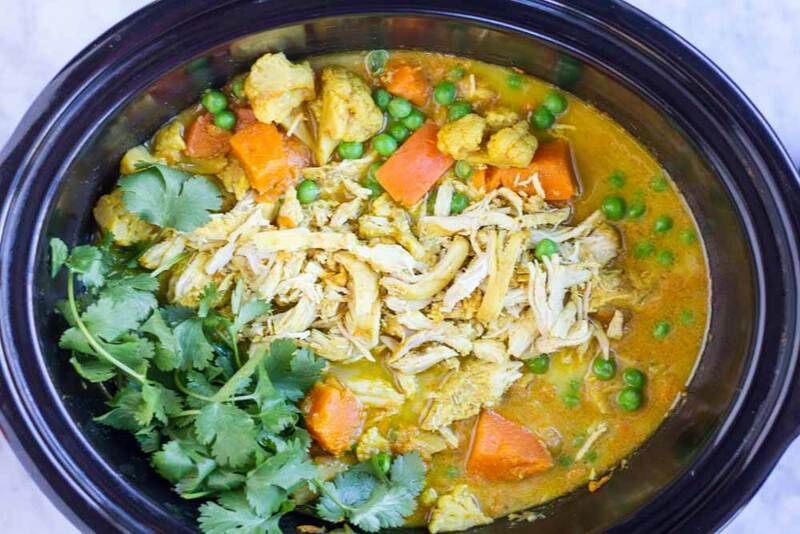 With just a few minutes of prep, you can come home to this fragrant, all in one, tasty Slow Cooker Coconut Curry with Chicken. Great for easy weeknight meals. OK… I think that I’m officially calling January “cauliflower season.” I just can’t get enough of it this year. Our weekly CSA box seems to always have it, so we have been making mashed cauliflower, roasted curried cauliflower, and cauliflower kale soup. And I’m back today with another recipe that features…. you guessed it: cauliflower!! My goal here on the blog is help make life easier for people like you and me. Life is full and can get overly busy at times. And my life seems to revolve around the people who live in my house and what we are going to eat next. Can you relate? I get up most mornings thinking about what’s for dinner. And since I work from home, I like to prep dinner in the morning so I can be available for my family later in the day when they get home. 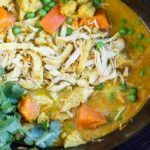 Now I know not all of us work from home, but with just a few minutes of prep in the morning, you can set yourself up to be walking in the door to the yummy smells of a creamy spiced sauce over tender vegetables and shredded chicken. I know this does not solve all of the problems of your busy day, but it sure makes it easier. I used sweet potatoes, cauliflower, and peas. You can use equal amounts of any vegetable that you like. I used a mixture of curry power, turmeric, cumin, garam masala, pepper, and cayenne. 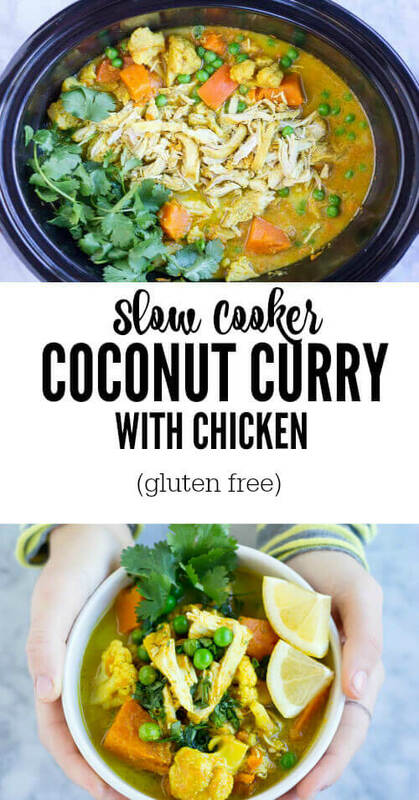 If you don’t have all of these, you can just use 1 and 1/2 tablespoons of curry power and it will be delish. I used boneless, skinless chicken breast, but you can use any cuts of chicken you like. I’ve used bone-in chicken thighs and seared them first before putting them in. For the extra liquid, you can use bone broth, vegetable broth, or plain water. I HIGHLY recommend using a flavorful broth though. 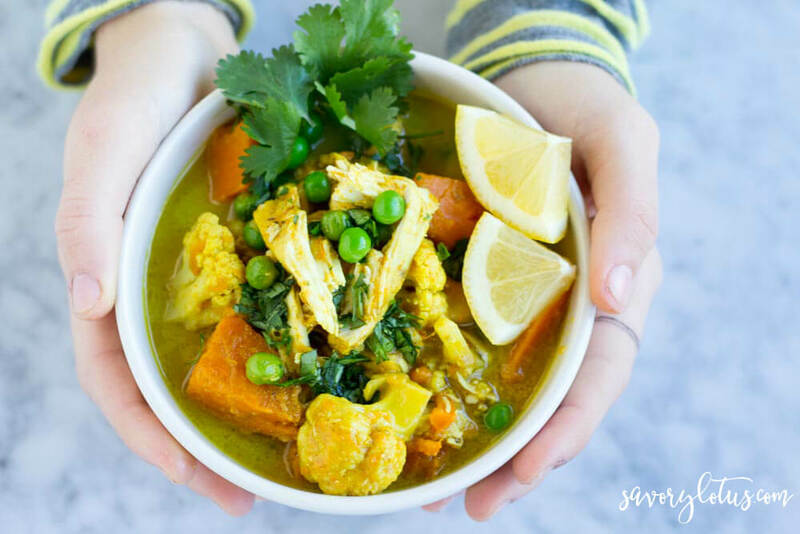 I usually eat this curry by itself, but you can serve over a bed of white rice or steamed greens. This recipes serves 6. If you have leftovers, you can easily freeze it in single portions for healthy lunches later. Happy cauliflower season! Have a healthy and sweet rest of your day! 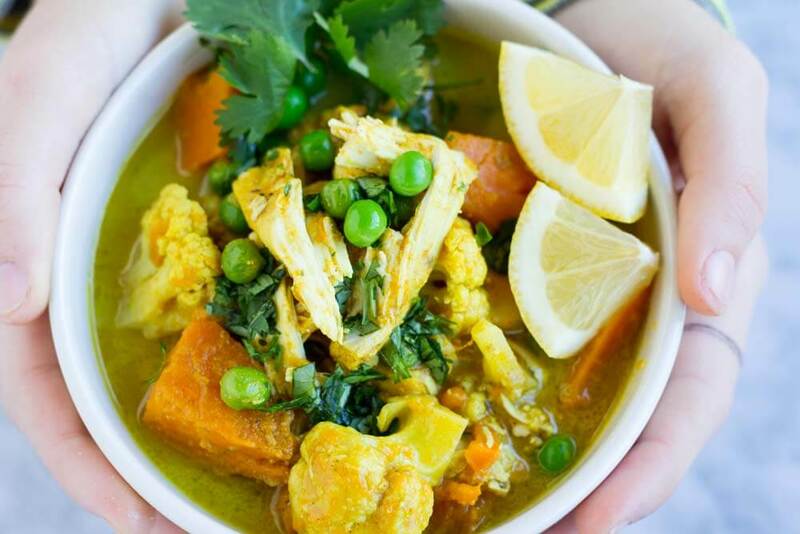 In a small bowl, combine curry powder, turmeric, cumin, garam masala, pepper, and cayenne (if using.) Set aside. Heat 2 tablespoons of fat of choice and saute onions until onions are translucent and starting to brown. Add garlic and spices and cook for another 30 seconds until spices are fragrant. Turn off heat and add in coconut milk, broth, ginger and salt. Stir to combine. While onions cook, chop your sweet potatoes and cauliflower. 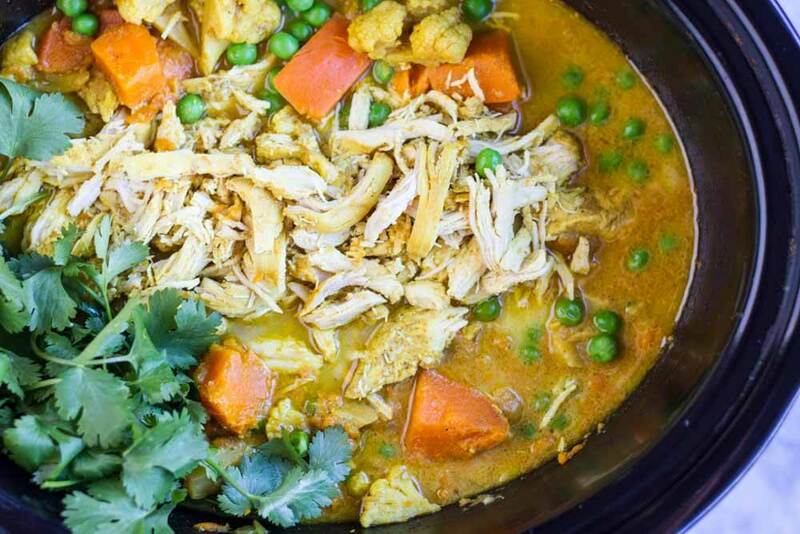 Layer chicken breasts, sweet potatoes, and cauliflower in to slow cooker. Pour coconut milk mixture over top. Stir gently to combine. Cook on high for 3-4 hours or low 6-7 hours. When cook time is done, remove chicken breasts from slow cooker. Set aside. Add peas to slow cooker. Then shred chicken with 2 forks and add back to slow cooker. Cook for 5 minutes more. Serve with fresh cilantro and lemon wedges.